Healing a second degree burn remains no trivial matter. Characterized by broken skin and deeper damage to the epidermis, second degree burns prove more serious than first degree burns. Many people get second degree burns from extended exposure to dangerous UV rays from the sun, causing a deeply uncomfortable and painful sunburn. Limit activities that irritate your skin following a second degree burn, including exposing your skin to chlorine or ocean water through swimming. Three degrees of burns correspond to the layers of skin each type affects. First degree, or surface burns, remain the least harmful type of burn and surface simply through exposure to the sun or touching a hot stove. You'll find recovery quick and more uncomfortable than painful. Doctors characterize more serious second degree burns by blistering and broken skin. With a second degree burn, the first layer of skin bubbles and blisters as well as turning red. A third degree burn, the most serious burn, affects all layers of skin as well as possibly organs, muscles, tendons and ligaments. Third degree burns can even cause permanent nerve and tissue damage. Healing a second degree burn takes patience and caution. Wash the affected area with warm water immediately after the skin has been burned. Cover the burn with a sterile gauze, remaining particularly careful not to pop any blisters. Don't apply topical burn creams or ice to a second degree burn as this impedes the healing process and, in the case of ice, even causes frostbite. Seek medical attention if the burn is larger than 2 or 3 inches in diameter. Exposing broken skin to the chemicals in pool water or the high salt content of ocean water is a recipe for irritation and possible infection. 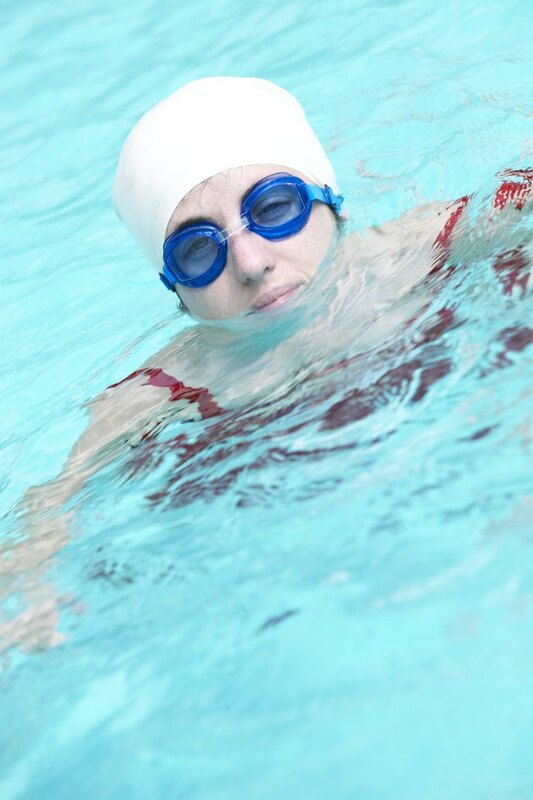 Swimming after a second degree burn leads to possible complications with the burn, as the chemicals can penetrate the layer of broken skin and cause issues with healing. Avoid swimming until the burn fully heals and no unbroken skin remains anywhere on the body. Since many people contract second degree burns through extended exposure to the sun, prevent them easily through regular sunblock application and skin care. Always use a full spectrum sunblock of at least SPF 30 strength when spending time in direct sunlight, and reapply regularly throughout the day. For other causes of second degree burns, always use caution and proper protection when dealing with fire and other hot elements in your environment.